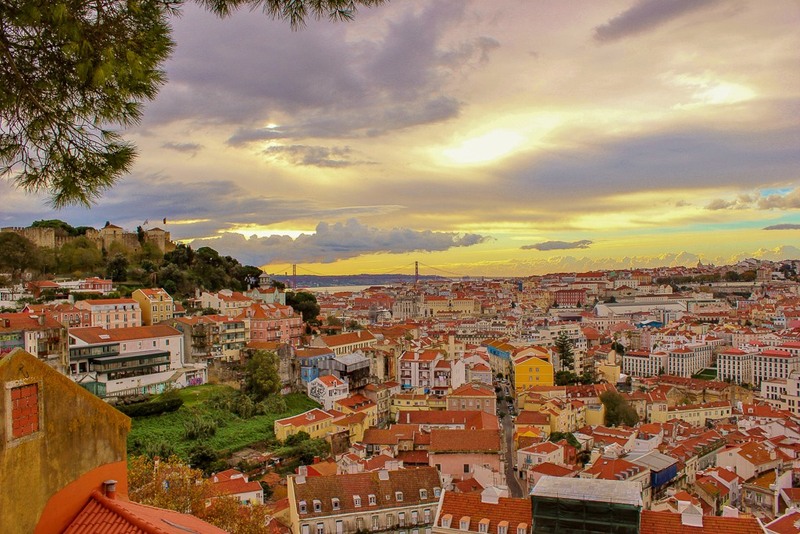 The city of Lisbon, Portugal is stunningly beautiful…and incredibly hilly. 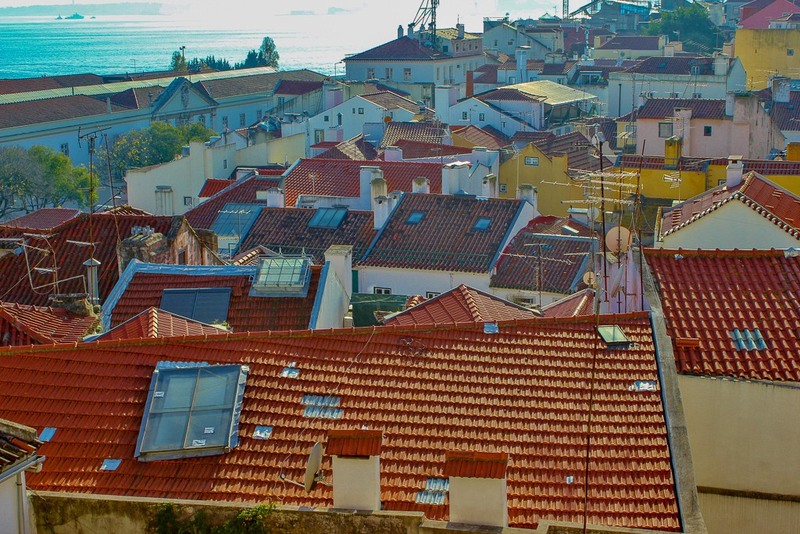 Nicknamed the City of Seven Hills (because there are, in fact, seven distinct hills in the city center), walking around Lisbon can be a bit of a workout. 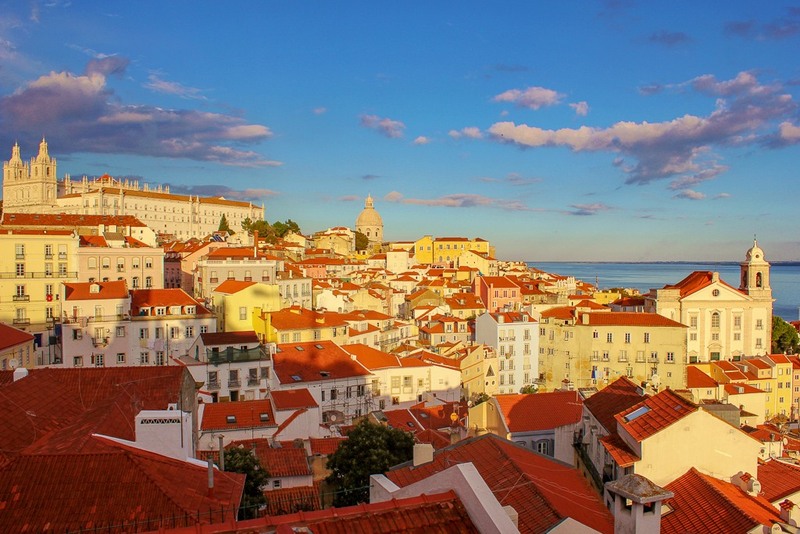 The reward, however – besides burning up all the calories from wine and custard tarts – are the numerous scenic Lisbon viewpoints. 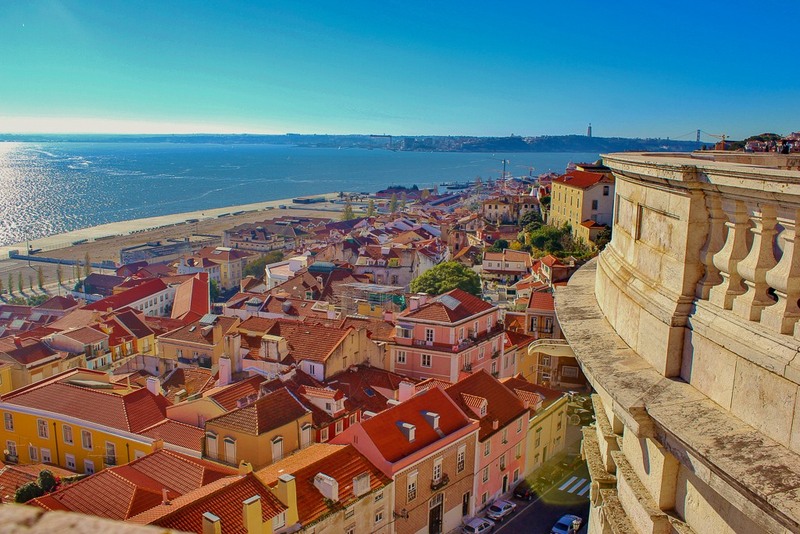 The hidden Lisbon terraces offer dazzling panoramic views of the bright and colorful city. 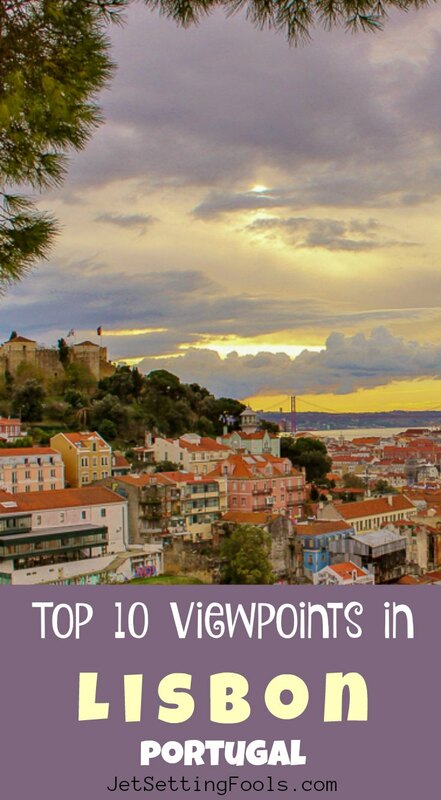 While exploring the picturesque Lisbon streets, we discovered 10 scenic viewpoints in Lisbon that we think are the absolute best in the city! Miradouros Lisboa – or, Lisbon lookout points – can be found all over the city. The Miradouros often have shaded benches, are sometimes accompanied by a small café, and are frequented by both tourists and locals. The small terraces offer the best views in Lisbon – and seeking out at least one is a must-do for anyone visiting the city. In our outline, the miradouros are listed first (#1-7), then the monument platform lookout points (#8-10). 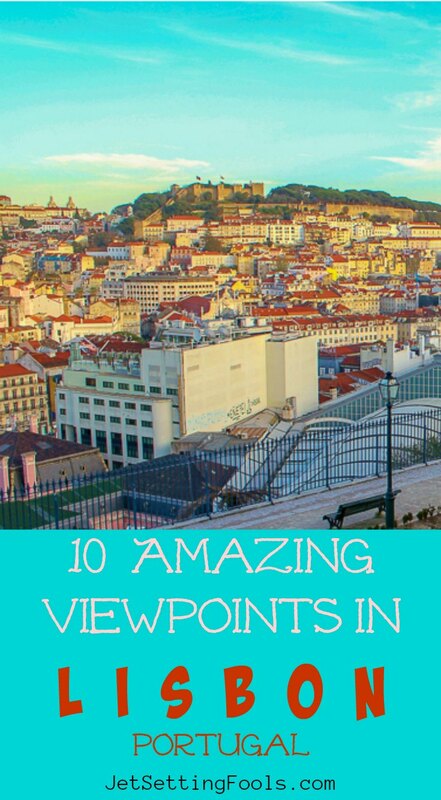 We think these viewpoints are the most beautiful places in Lisbon (and the best photo spots in Lisbon, too!). 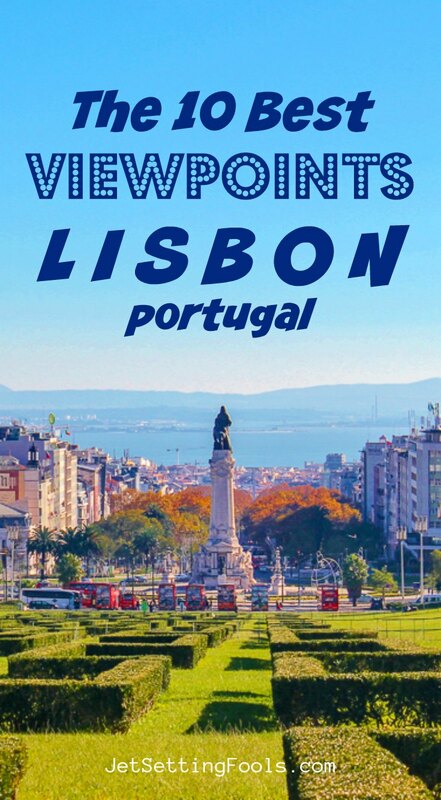 To help you find your way, we have included all of the locations on a Lisbon Viewpoints map (See Lisbon map below!). The Graca Lookout (called Miradouro da Graca and Miradouro Sophia de Mello Breyner Andersen) is one of the most popular places for Lisbon panoramic views. The easy-to-find location is near St. George Castle Lisbon (Castelo de Sao Jorge) – and the miradouro provides one of the best views of the famous landmark castle. The terrace ranks as one of our favorite miradouros for wide city views and watching the sunset in Lisbon. Top Tip: Before leaving the viewpoint, take a look inside the Graca Church; it’s one of the Must-See Churches in Lisbon. Portas do Sol is a heavily visited tourist spot – as evidenced by the number of street vendors and musicians that frequent the spot. It’s for good reason: the Lisbon viewpoint offers spectacular vistas over the Alfama neighbhorhood. The scenic view encompasses two Lisbon landmarks: Sao Vicente de Fora and the National Pantheon. There is a second terrace, Miradouro de Santa Luzia, next to Portas do Sol. There is a small cafe and the narrow platform is almost always crowded. Top Tip: A statue of St. Vincent – one of many Lisbon monuments to saints found in the city – stands next to the small café above Portas do Sol. Across the street are convenient stops for Lisbon Tram 28 and Tram 12. Supposedly more secret than the two previous lookout points, we found more tourists than locals at Miradouro Senhora do Monte (or Our Lady of the Hill). Further north than Miradouro de Graca, but with a more elevated vantage point, it’s one of the most stunning Lisbon viewpoints. Top Tip: We suggest packing a small picnic lunch or a bring-your-own adult beverage to enjoy along with the Lisbon scenery. It’s definitely a hike to get to this Lisbon miradouro, but is worth the effort! Popular with local dog owners (and few tourists), the views from Miradouro Monte Agudo are oriented to the south. The Lisbon panorama perspective includes a clear view of two famous landmarks in Lisbon: Cristo Rei Statue and 25 de Abril Bridge. Top Tip: An easier way to get around Lisbon, City of Seven Hills, is by using public transportation! 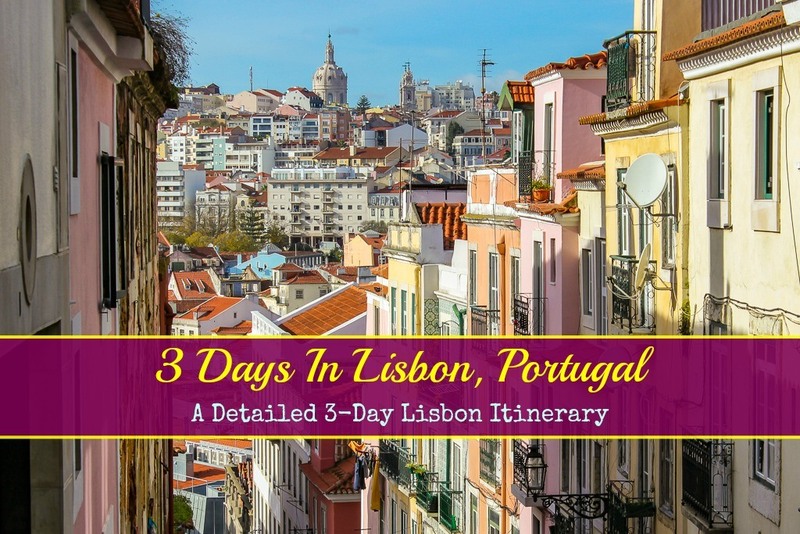 We include tips on Getting Around Lisbon at the end of the post. 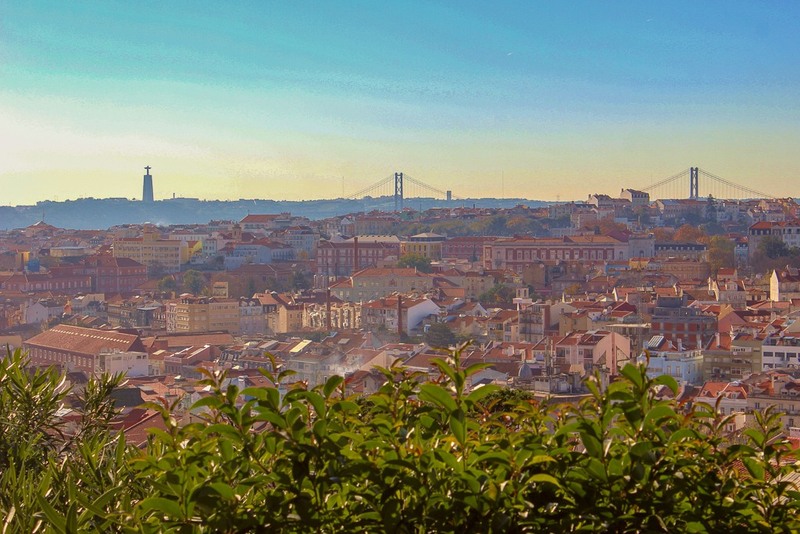 Perhaps not one of the best of Lisbon lookout points, Miradouro de Santa Estevao is still one of our favorites. There is no cafe at the viewpoint – or even any benches – but the terrace is Alfama miradouro is a quiet and serene spot in the busy city. Top Tip: After spending a couple of hours winding through the dense and narrow streets of Alfama, go to Santa Estevao Miradouro to catch your breath – and a view. Miradouro de san Pedro de Alcantara might reign as one of the better skyline viewpoints of the Lisbon Old Town. 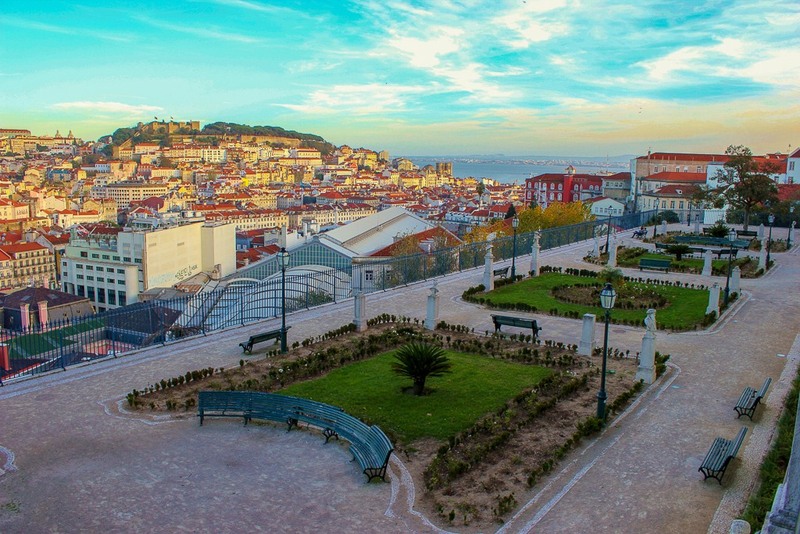 A two-level park, the miradouro in Bairro Alto provides views to the east over the city with Alfama and the castle in perfect sight. 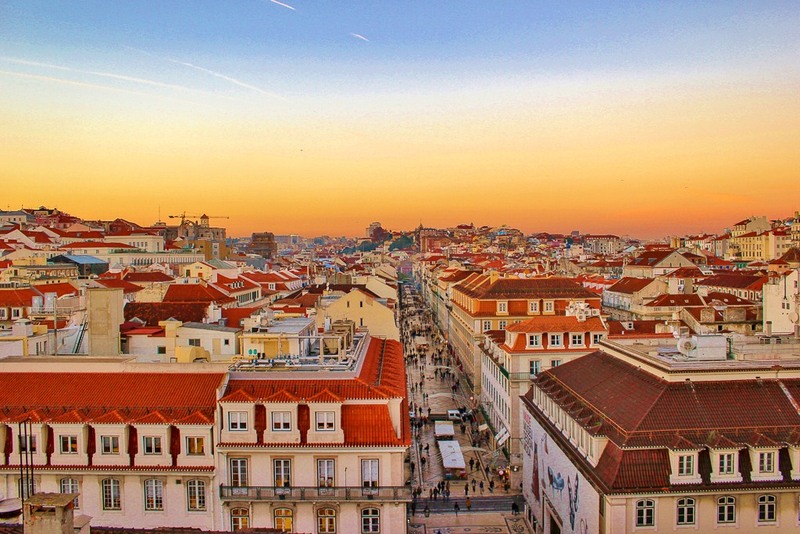 Top Tip: The soft light of the setting sun gives the entire city a warm glow, possibly making the Bairro Alto Miradouro the best sunset view in Lisbon. 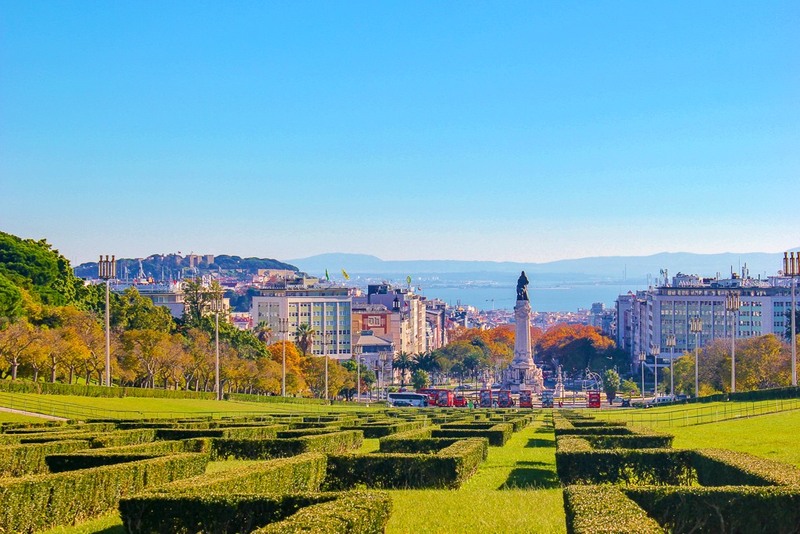 The Eduardo VII Park – one of the best parks in Lisbon – extends 62 acres from the north end of Avenida da Liberdade and gradually inclining to one of the stunning Lisbon lookout points. At the top of the Lisbon city park, an enormous flag billows in the breeze above a picturesque fountain. The views south over the green lawn and perfectly manicured hedges down the river is quite a sight. Top Tip: Cross the street to the Amalia Rodrigues Park for even better views. Arco da Rua Augusta is the towering arch on the north side of Praco do Comercio. The famous arch leads into the Baixa district via the pedestrian-only Rua Augusta. There is a lift to the top of the grand arch where guests have 360 degree views of Lisbon. Top Tip: The lift up only costs €3 and tickets are purchased in a small shop north of the arch on the east side of Rua Augusta – and it’s free with the Lisbon Sightseeing Card! On the south bank of the Tagus River, the Christ Statue Lisbon (Cristo Rei), stands on a hill looking across the river to the city – and provides a stellar panorama of Lisbon and the 25 de Abril Bridge. The views from the surrounding park are phenomenal (and free), but a lift for €6 takes visitors to the top of the 269-foot-tall viewing platform. Top Tip: To get to Cristo Rei, visitors can take a ferry ride across the river to Cacilhas. 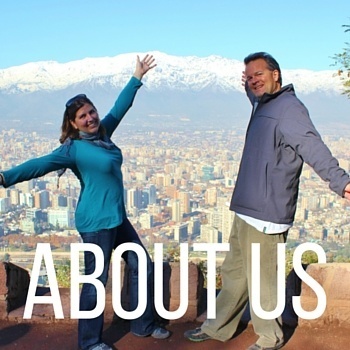 Read our detailed post on Visiting Cristo Rei. Also called the Church of Santa Engracia, the dome of the National Panthoen building that took 284 years to build is visible from many points in Lisbon. Inside, exquisitely patterned marble and memorials to Portugal’s most revered historical figures are worth looking at, but a climb up the stairs to the rooftop provides one of the outstanding viewpoints of Lisbon and the river. 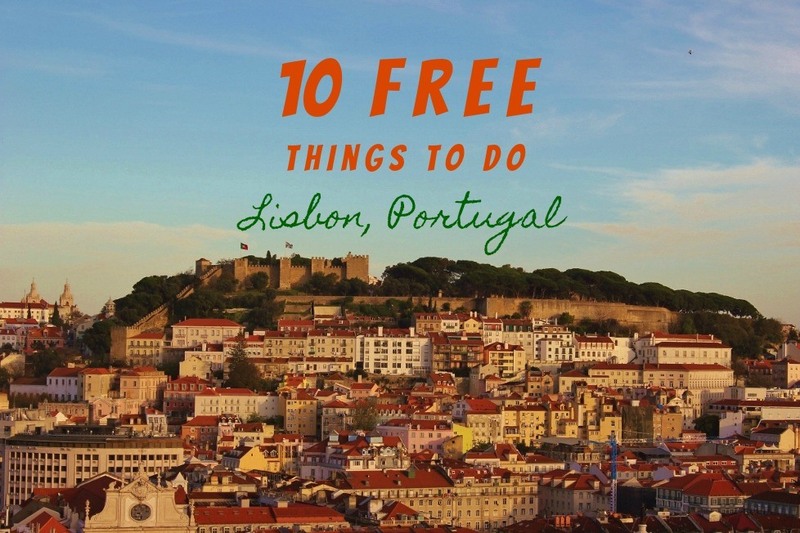 Top Tip: Entry costs €4 – and it’s free with the Lisbon Sightseeing Card! Looking for more panoramic city views? 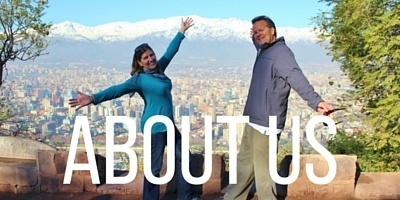 Check out these popular viewpoints! The Miradouro Santa Catarina Lisbon – sometimes referred to the Miradouro do Adamastor for the statue of Adamastor that stands on the Lisbon lookout – is known for it’s sweeping and close views of the Tagus River, Cristo Rei and April 25th Bridge! UPDATE: On a return trip to the city, we visited Miradouro Adamastor Lisboa…only to find it completely fenced off for renovation. Hopefully, the work will be finished by summer, because it is definitely one of the best Lisboa miradouros! The Lisbon Santa Justa Lift takes passengers from the lower streets of Baixa up to Carmo Square in the Bairro Alto district – no climbing required! It was built in 1902, but today, it is somewhat of a tourist attraction and although we heard the views are fantastic, we skipped it. Tickets are required; find the current Santa Justa lift price and other info on the official Carris website. A new attraction in one of the lesser-visited Lisbon neighborhoods, Alcantara, the Pilar 7 Bridge Experience offers one of the best views in Portugal. Visitors ascend to the top of a pylon on the Ponte 25 de Abril Bridge that features viewpoints from a glass enclosure. Tickets required. Just north of the Lisbon city centre is one of the highest viewpoints in the city: the Amoreiras Towers. The viewing platform sits 174 meters above sea level and offers 360 degree views of the city. Find out more! 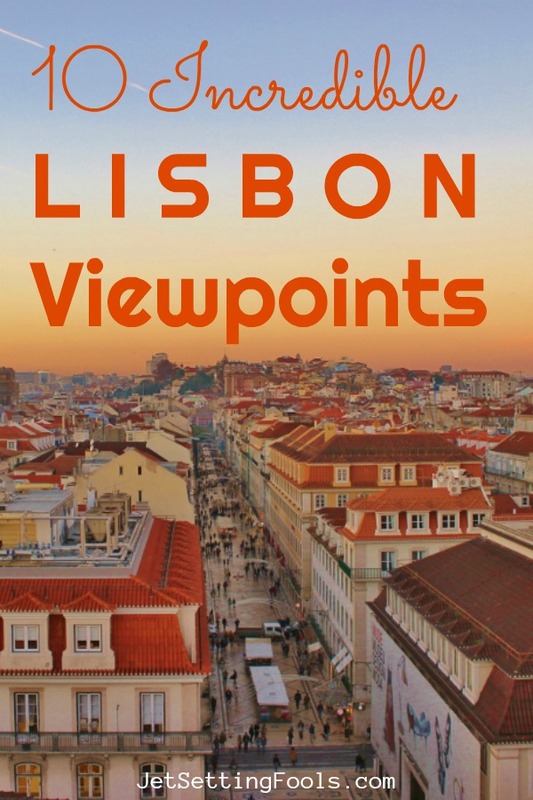 Use this link to Google Maps for the online version of our Lisbon Viewpoints Map. 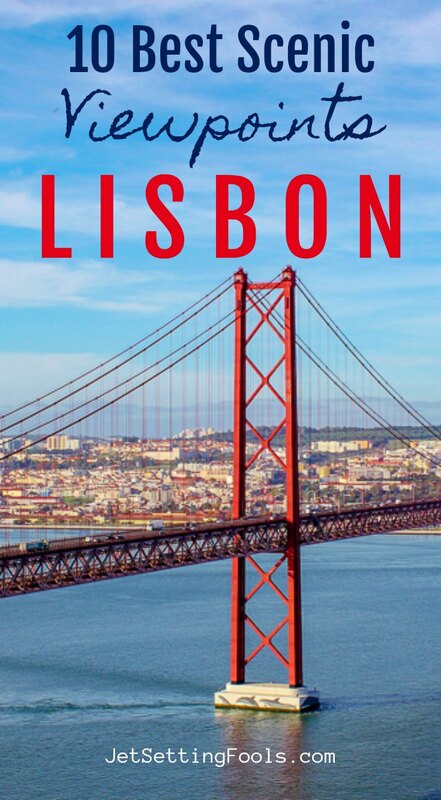 Looking for more things to do in Lisbon? Check out our list of 10 Free Things To Do in Lisbon, which includes shopping at the sprawling outdoor Flea Market Lisbon, visiting historic Lisbon churches and other Lisbon landmarks. If you plan on visiting museums and sites – and traveling via public transportation – the Lisboa Card can provide significant savings. 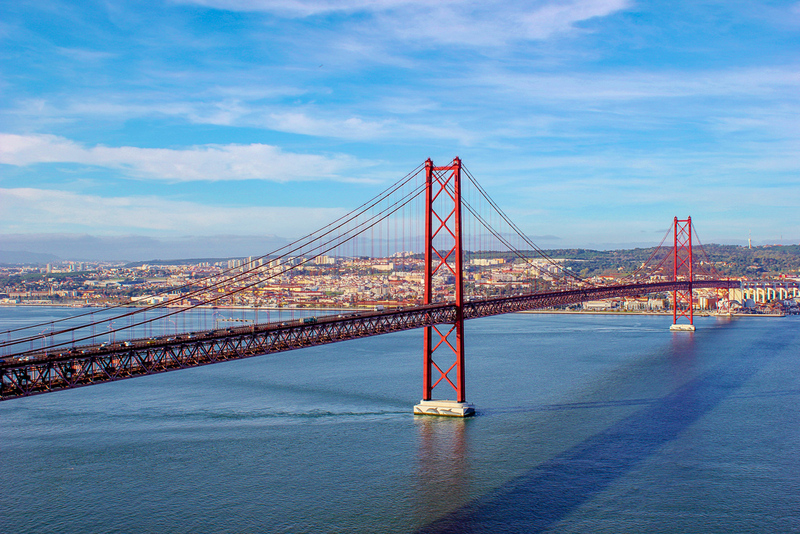 With the Lisboa Card, all public transportation (including the Santa Justa Lift), is free as are many museums, and top Lisbon sights – like the included Pilar 7 Bridge Experience. Other sights, like St. George Castle Lisbon (Castelo de Sao Jorge), can be visited with a reduced admission fee. Although the public transportation options in Lisbon are ample, it can be confusing for anyone who isn’t used to using public transport. Find information about riding the trams (including the famous Tram 28 Lisbon) here and click here a Lisbon Metro map. Easier to figure out than public transport is the Lisbon Hop-On Hop-Off Bus that makes stops in Lisbon areas near all the popular tourist spots. 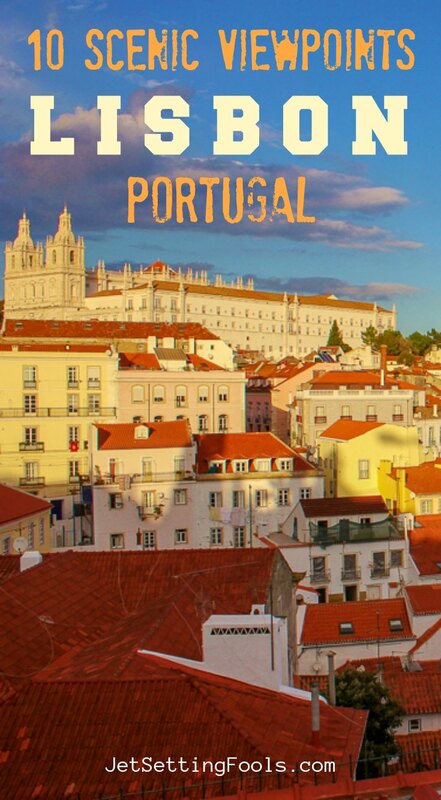 During our trips to Lisbon, we have stayed in Airbnb apartments in Alfama (the east side of the city) and Lapa (the west side of the city) – and we have also stayed in the posh Altis Hotel and Spa in Belem. We usually prefer apartments – for the extra space and kitchen – but loved our stay at Altis! However, Altis is located in Belem, which is a bit far from Lisbon attractions. 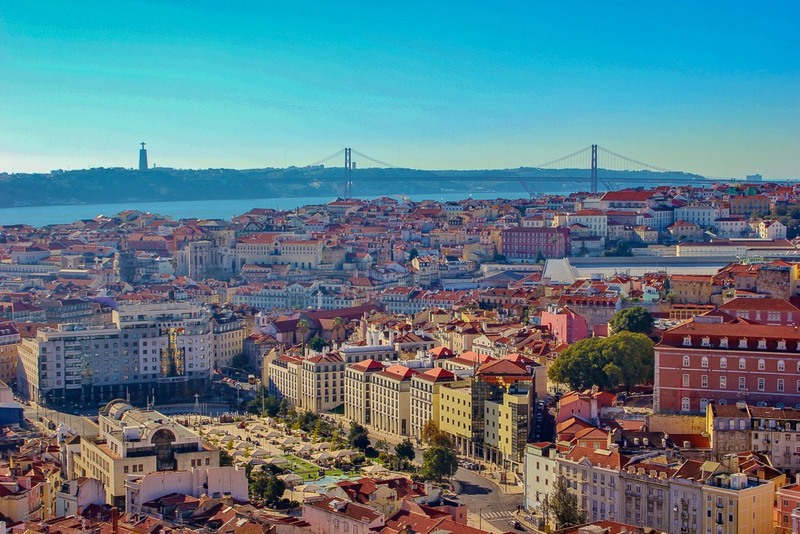 Travelers who would rather stay in the city center have many options for Lisbon hotels. Check out these top-rated hotels (based on guest reviews!) for your upcoming trip: TURIM Marques Hotel, My Story Hotel Rossio, Portugal Boutique Hotel. On a budget? Check out these popular Lisbon Hostels: Hostel 15, The Dorm, or New Lisbon Concept Hostel. 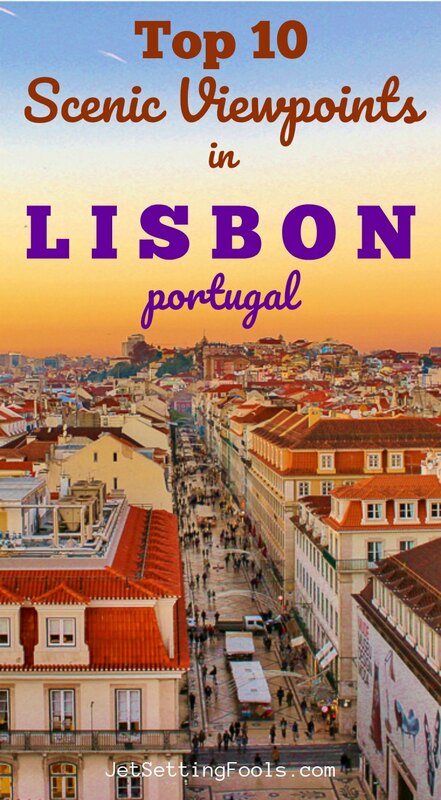 If you are looking for a Lisbon Hotel or Hostel, start your search onBooking.com – like we do! 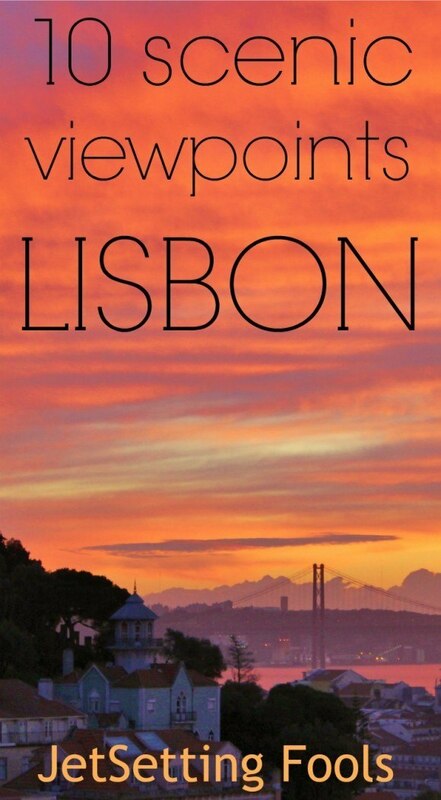 Lisbon can be reached by plane, train, bus or car. The Lisbon Portela Airport is the international airport. 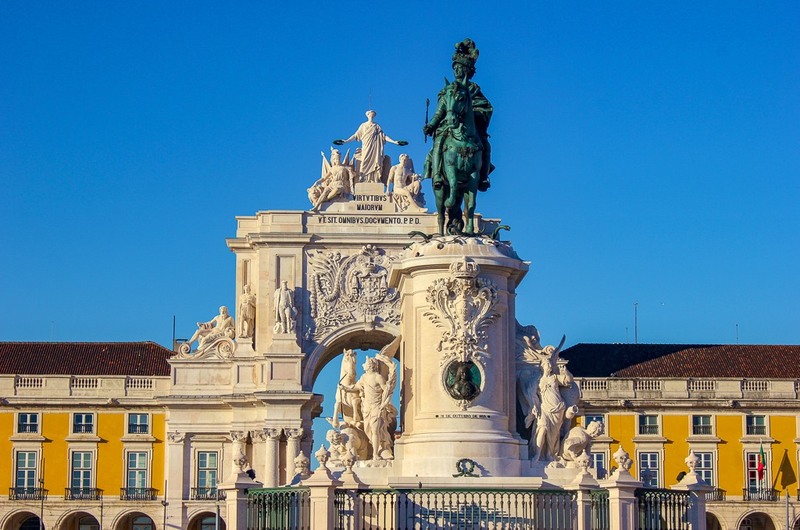 We took a cab to get from the Lisbon Airport to the city centre (but feel we paid a bit too much for the ride, so you may want to consider booking airport transfers in advance). 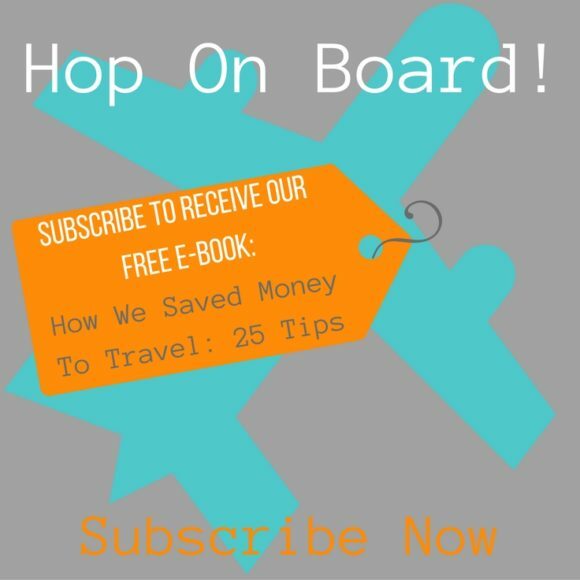 Our preferred method of getting anywhere is by flying (we are JetSetting Fools, after all!). When we need to purchase plane tickets, we start our search for the best deals on airline tickets on Skyscanner. If arriving/departing Lisbon by train or bus, there are several stations in the city. When booking travel by train or bus, pay close attention to the station of arrival/depature. 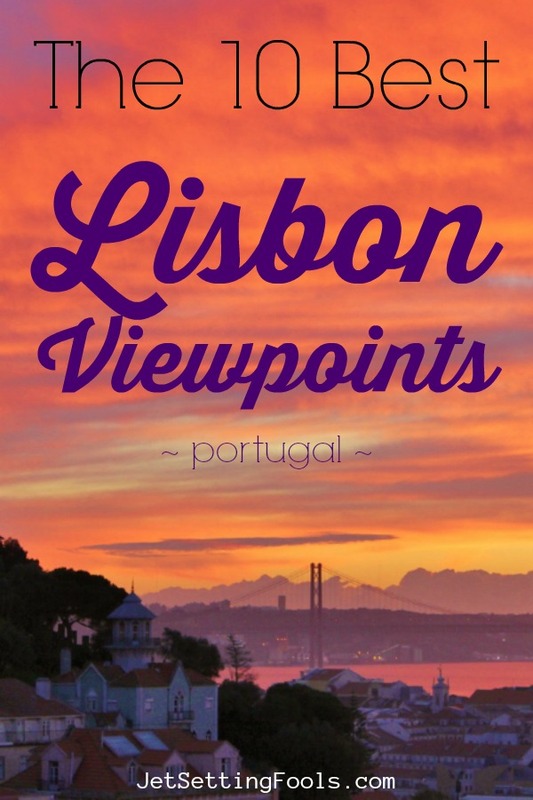 We want to know: What is your favorite Lisbon viewpoint? 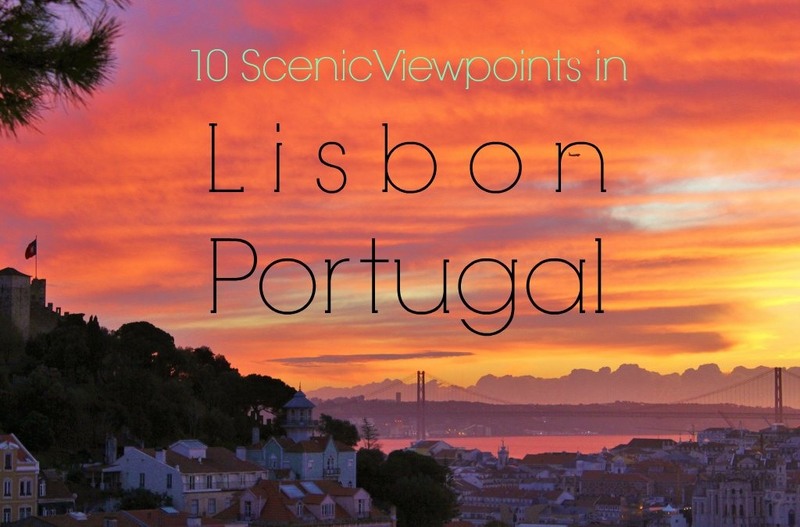 Are there other scenic viewpoints in Lisbon you would add to our list? Tell us in the comments! Been to Lisbon many years back its a great city ,Great photos guys hope your ok .. Cheers Deano! All is well, we wish the same to you!